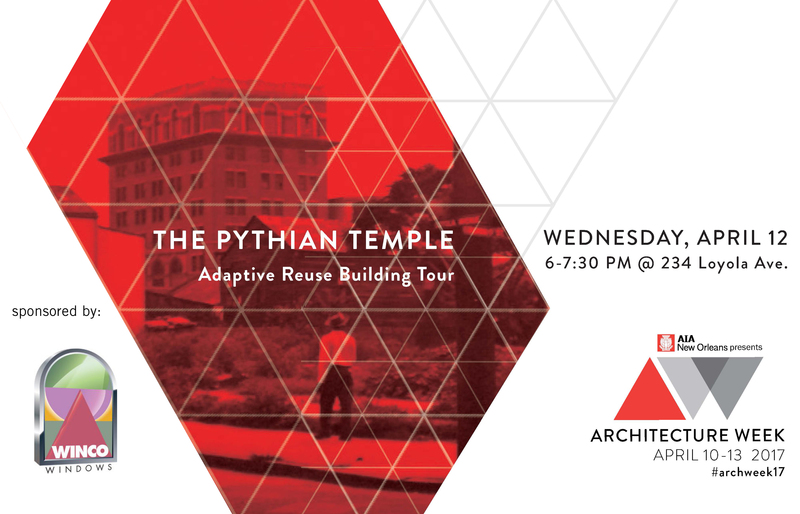 Join us for an exclusive presentation and tour of the recently renovated Pythian Temple in New Orleans. The Pythian Temple, originally constructed in 1908 by the Knights of Pythias, was the first African American owned high rise building in the City. The building at the corner of Loyola Avenue and Gravier Street housed several offices and businesses for the African American community and was the birthplace of the Krewe of Zulu. In 1923 after the original debts for the building were paid, an enclosed ‘roof top garden’ was added and served as a popular venue for jazz musicians and dance events. In 1941, the building was sold to the Higgins Industries Company and served as offices for the construction of the infamous Higgin’s Boats that were vital to the end of World War II. The building was modernized in 1957 with a metal and glass slipcover to match the recently constructed City Hall. For the next 40 years, the building served as the Civic Center building and housed a district court, a bank, and medical offices. The Pythian Temple sat vacant before Hurricane Katrina, and was purchased in recent years by Green Coast Enterprises, the Crescent City Community Land Trust, and ERG Enterprises to offer affordable rental units, offices to several non-profits, and a food hall on the ground floor level. Green Coast Enterprises selected local award-winning firm studioWTA to help them realize their vision for the project. Along with Landis Construction, the team worked diligently to research the history of the building and to restore its original grandeur. Missing terra cotta and ornate brickwork was carefully studied and reconstructed, while the rest of the facade underwent an extensive facelift to return the building to its former glory. This event is part of a larger series of program for Architecture Week New Orleans, April 10 – 14, 2017 and is free to the public.